"With 2018 marking the 7th anniversary of the Syrian conflict, this issue of FMR explores new insights and continuing challenges relating to the displacement of millions of Syrians both internally and in neighbouring countries. What we learn from responses to this large-scale, multi-faceted displacement is also relevant to other situations of displacement beyond as well as within the Middle East." 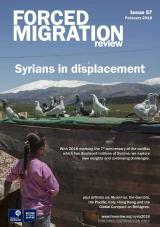 There are 27 articles focusing on the theme of "Syrians in Displacement," plus six general articles on other topics. Readers can access FMR articles 1) individually, in HTML, PDF and MP3 formats, 2) via the digest feature, or 3) as a complete issue. Back issues of FMR are available here. FMR is an open access publication. It is available online and in print in English, Arabic, French and Spanish. Audio versions of articles are available in English.